Last Friday I shared the delicious Pot Roast Sliders recipe I made for the recipe swap. After letting Tom pick out the slider recipe, I clicked through the side dishes and salads on Jaida’s blog to figure out something to make with them. This recipe jumped out at me immediately. 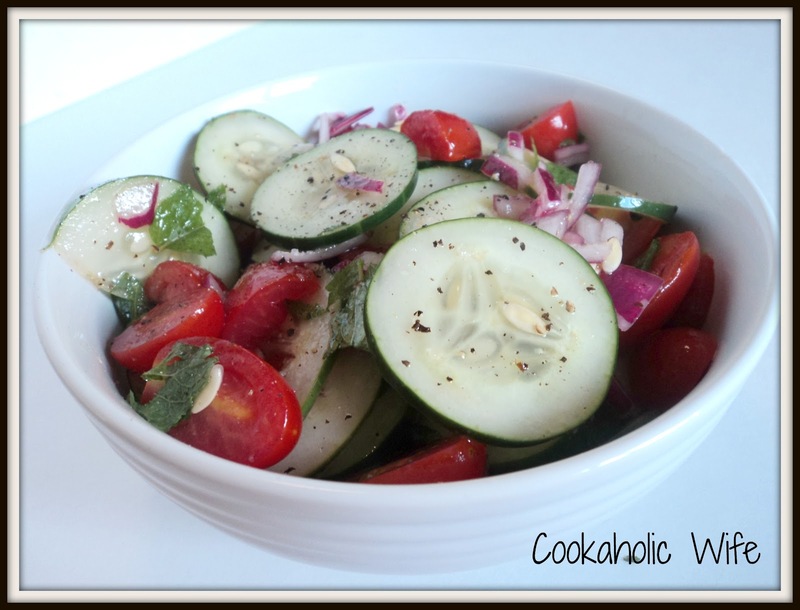 Its a great summer salad and one I hadn’t tried before. 1. Combine all of the ingredients in a large bowl. Toss to coat. Refrigerate at least 30 minutes prior to serving. I left the skins and seeds on/in the cucumber since I figured it wouldn’t make too much of a difference. I ran out of time before making this recipe and chose to just let it marinade while I prepped and made everything else for dinner. The vinegar in this reminded me a lot of the Korean Cucumber Salad I make but the mint gave this a really nice fresh and sweeter taste I wasn’t expecting. This is a great little summer salad you can whip up fairly quickly and would be perfectly alongside burgers, grilled chicken, roasted pork…just about anything you can imagine. Mmm…I love this salad! So glad you enjoyed it, too! What a gorgeous salad! Love the mint leaves, it sounds so refreshing!